ATP players Tim Smyczek, center, and Benjamin Becker discuss the singles draw. BB&T Regional President Dont? Wilson addresses the party. The BB&T Atlanta Open can usually be affiliated with words such as tennis, joy, and comaraderie. However, here is a new word that will forever describe July 25, 2015 — philanthropy. 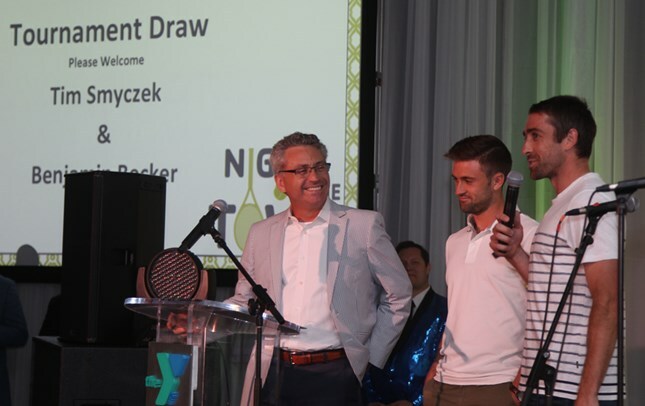 BB&T, along with Gas South and Greenberg Traurig, helped spearhead the charity event, “Night On The Town,” in order to raise money to benefit YMCA of Metro Atlanta Youth Sports Programs. To quote one of the posters that adorned the lavish ballroom where the event was held, “Helping all kids get off the bench and back in the game,” is the lead goal for YMCA sports programs. The night transitioned to a Q&A with BB&T Atlanta Open players Benjamin Becker and American Tim Smyczek. The players provided tennis fans to get a feel of the players’ emotions leading up to the unique tournament. German and No. 53-ranked player Becker claimed, “This tournament has great convenience. This is a great organization, beautiful event, and I’m glad to be back.” This year marks Becker’s second year playing in Atlanta. Becker, along with big name players such as John Isner and Andy Roddick, will be sure to show off great tennis at this event. After Becker, Wisconsin home grown player Tim Stycaek, agreed, stating, “This is a unique event. I am treated very well here.” This is the sixth time the 75th best player in the world has paid a visit to the BB&T Atlanta Open. Night On The Town achieved this goal in style. In one room, guests mingled as hors d’ouvres were passed around. In the same room, a table of sporting memorabilia was shown off in preparation for the silent auction that would take place later that evening. The room next was reserved strictly for dance and dining. Sequined clad ushers led guests to this designated ballroom, greeted by an opening band that blasted funk and pop music. The night sizzled with more excitement as BB&T, Gas South, and Greenberg Traurig representatives, Danta Wilson, Kevin Greiner and Tony Hatchett provided introductions. 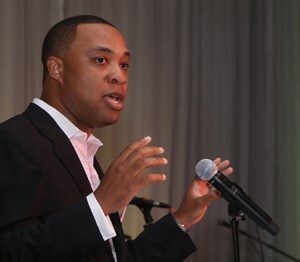 Wilson had confirmed the night’s success as he stated, “This year we raised more money than ever before. $250,000 was raised, so now these youth can participate in sports programs they wouldn’t be able to partake in otherwise.” The crowd roared in approval, elated that underprivileged children can now participate in sporting opportunities unattainable to them without these scholarships. All in all, the night had excellent approval ratings. A day of tennis is great enough—but a successful philanthropic event is the cherry on top.